Call us today. For a limited time we are offering a special rate to our new customers. Call for details. Since the very start of our Dental Practice has a philosophy to educate the patients so they can clearly understand their dental and health conditions and see what options available to them. Every person, every condition and case is unique. We want to help you make an informed decision and we allow you to make your decision together with us. You are welcome to ask ay questions at any moment. Our goal is to achieve for you a healthy, beautiful and long lasting, self maintainable dental condition. We are trying to workout the treatment option which is best for you and is financially acceptable. Our warranty is that we provide to best of our knowledge and experience for the best result possible. Achieve a healthy, beautiful and long lasting, self-maintainable dental condition. Understanding the financial concerns and limitations of our patients we implement financial arrangements, which are mutually acceptable. 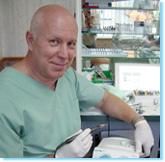 27 years experience in cosmetic dentistry with a holistic and biological dental approach located in Vancouver, B.C. Member of the American Academy of Cosmetic Dentistry, CDSBC, CDA, HANS, etc. Biodentistry accentuates the use of non-toxic, non-reactive, non-allergenic with better compatibility materials used in dentistry for treatments or restorations. It is focusing on the impact that toxic ingredients of material, bacterial toxins or hidden infections have on local oral tissues and on general health of the body. Holistic(wholistic) means interrelation of dental condition or problems with other parts of the body or the body in total. Most important and most frequent (most popular) problems associated with interaction of toxic substances with the dental tissues and with body in total is mercury from amalgam silver fillings. The detrimental effects of mercury leaking from dental amalgams on the health are well publicized. In the 1950s, Reinold Voll, M.D., Germany, discovered that each tooth in the mouth relates to a specific acupuncture meridian. Using his electro-acupuncture biofeedback technique, he found that if a tooth became infected or diseased, the organ on the same meridian could also become unhealthy. He found that the opposite held true as well, that dysfunction in a specific organ could lead to a problem in the corresponding tooth. Our Dental Practice provides multiple dental services for our valued patients. We are dedicated to 'catering' to you, our patient. We respect your time, economic concerns, dental and medical history, and all of the factors that make each one of us unique. We are dedicated to the best care, service and results provided to our patients. In addition to general dentistry our dentist specialize on implants and associated prosthodontics restoration. All restorations, whether it is just fillings or it is special crowns and bridges can be requested to be done with exceptional cosmetics. We also stress prevention of dental diseases and longevity of our restoration and cosmetic results. *Air abrasion cavity preparation – very delicate – accurate and precise. Requires much less anesthesia and is tissue selective. *Air water jet soda polishing – provides thoroughly and gentle cleansing of all surface even those with difficult access.